Euro-spec Mitsubishi iMiEV at Paris show | What Car? The Euro-spec Mitsubishi iMiEV will be revealed at the Paris motor show at the end of September. Along with the design changes, the Euro-spec iMiEV also gets a safety upgrade. These upgrades include active stability control and side curtain airbags as standard. 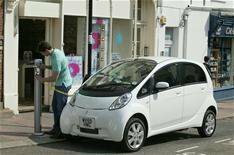 Mitsubishi has also slashed the price of the iMiEV from 38,699 to 28,990 for orders that are placed for delivery before January 1. Factor in the 5000 Government grant available for the purchase of low-carbon cars and you could be paying 23,999 for the electric supermini.